Put a little Moon in your closet. Somewhere between happy and hopeful - you'll find me. I'm alive with four less teeth and two eyes that see fair skylines up ahead. My wisdom teeth are gone gone gone !!! I walked into the Dentist's office at 2pm on a Tuesday and opened my eyes at 4pm in a recovery room. In between those hours, a gentle Scottish nurse greeted me, asked me about my dreams, and laid me down on a surgery bed. She sweetly spoke to my nerves bending out of place and brought me a warm blanket, it reminded me of home. I blabbered on for awhile about my future plans ( mostly random words made up at the time ) until the anesthesiologist came and pressed a needle into my arm. He said "Miss Amy, Hawaii beaches are waiting for your feet." When I woke up, I thought I was walking on clouds. The worst part of the whole ordeal was my post-surgery diet. Nothing you can chew, only soft food, easy to swallow, no crunch, no teeth, nothing palatable AT ALL. I spent the entire week drinking chocolate slimfast for energy and pressing a pillow to my face for comfort. All I could think about was chicken fingers and dill pickle chips. Now onto something a little more exciting than wisdom teeth. The Canadian label Moon Apparel asked me to be one of their brand ambassadors !! If you haven't heard of Moon Apparel, here's a very eloquent description of their philosophy ( borrowed from their website. ) : "Since the dawn of time, we’ve looked upwards to the moon as a guiding light and source of inspiration. Its presence unites us, mystifies our senses and rouses our emotions. MOON Apparel embodies the spirit of this inspirational force and was born from the idea that a timeless and uncomplicated style is always modern." A link to my interview with Moon apparel here. The color orange demands attention. Pairing neutral colors like a dark brown or green trouser helps calm down the brightness and keeps the look wearable. The orange blouse and earthy green trousers are both perfect shades for Autumn. Instead of following the colorful route of pumpkins, I opted for a more toned down look. The dark green works great against the bright orange, keeping my look bold but not over the top. I decided to add a little bit of uniformity with my harvest colored crown. You could also achieve this by adding a bright colored accessory, like a bracelet or a clutch. The trousers can be worn with anything -- but look especially great defining your silhouette against an over sized top. 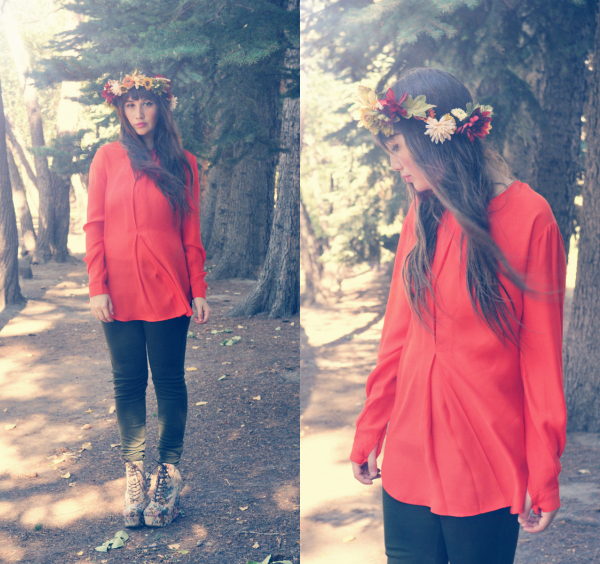 The blouse is the perfect staple for standing out, whether it's worn with casual jeans or a sleek pair of dress pants. Everyone should own a beige colored dress. The options to accessorize are endless. The beige sweater dress is the perfect hue for pairing with a number of things in your wardrobe. I chose my knit hat and thermal leggings. You could also wear big chunky necklaces, colorful scarves, belts, or anything really. It's an ideal dress for being creative with your closet. I chose to keep my look simple by wearing similar fabrics and complimentary colors. The dress is made of a sweater material so it's perfect for Autumn's cool and crisp air. As the temperature stars falling, sweaters are ideal for keeping warm. Invest in a light fabric sweater that is versatile and wearable in all seasons. In the colder months, the sweater can be layered with a scarf or jacket. This light richly colored sweater is great for all seasons. On a warm Autumn day, it's nice to follow nature's color palette. The rustic color in the sweater blends into the changing season. 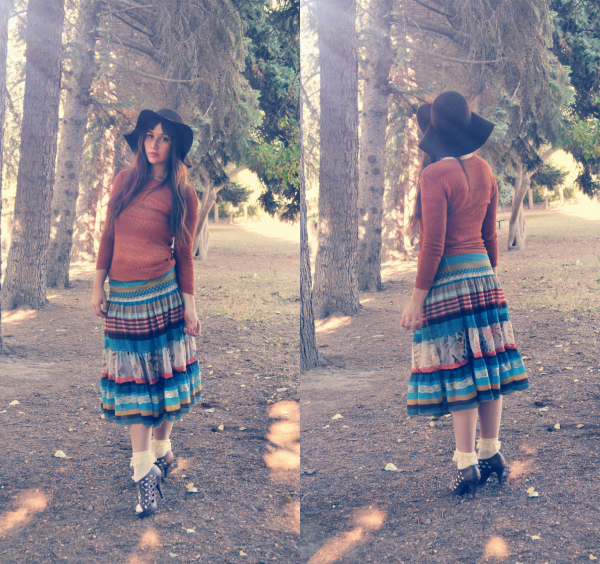 I decided to wear a patterned skirt that dresses up the sweater and my signature socks to make the look playful. The color and fabric of the sweater are so versatile, you can wear it with anything. ooo I love Moon Apparel's description of themselves- it's so dreamy- which fits your blog oh so perfectly! i especially love the first look- and your crown added so much interest to the whole outfit. and i hope you're feeling better after the wisdom-teeth-pulling! i need mine pulled too and i'm postponing it for MONTHS especially for that reason. who can survive a week without chicken tenders, i ask you?! I think you'd look cute in anything. Ooh wisdom teeth surgery is no fun! I had to go 3 separate times to get mine out! I absolutely love the collarless orange blouse and especially how you styled them with the dark green pants and crown- you look gorgeous! I think the pointelle sweater is my favourite, especially paired with such a very pretty skirt! Your wisdom tooth experience sounds like it was far more intense than my ordeal, goodness! Kudo's to you for being such a trooper! Very pretty styles. Cant decide my favorite. Love the flowers but the last look is pretty awesome, too! I love the shoes from the first one pic! Where is it? Follow you! Love your blog, you are a very pretty girl!